I’m about to do something very unusual for me and it feels a bit weird. I’m almost feeling guilty about it but frankly, it has to be done. What can this be, I hear you wonder? Well…the thing is…I’m going to write about a new(ish) range of skin products that are not…gulp….chemical free…or…. completely natural! I know I know. Why, I hear you ask? Well, I kept hearing about these products that use extremely advanced technology and cutting edge science. And people are simply RAVING about them. 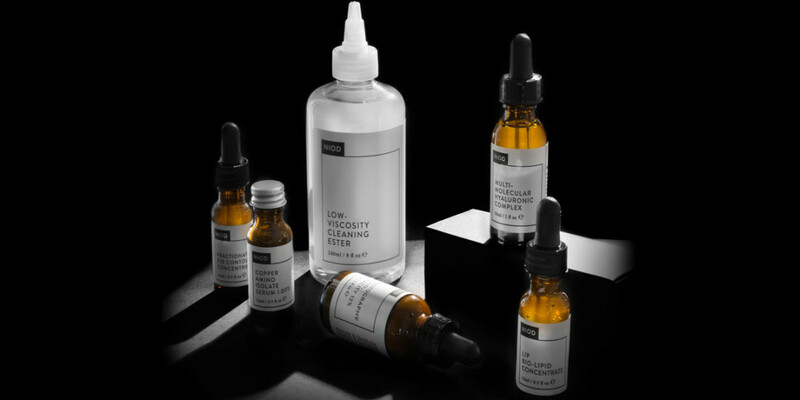 I started by trying to find out just how bad the chemicals used in them are (I have limits about how far off course I’m prepared to go) and even got some feedback from Brandon Truaxe, the creator of the products which are called NIOD. Peptides––which often but not always contain the word, “peptide”. These classes are not usually plant based but are made up of very natural amino acids chained together. Biotechnology Science––which generally relates back to a sourcing from biological compounds that are natural. These names are often very chemical sounding but they are absolutely rooted in biology and are a very key reason NIOD is so effective. An example is N-Acetyl-D-Glucosamine-6- Phosphate Disodium Salt in MMHC. There is nothing better than this technology in the world. Polyphenols––generally 100% plant-derived but are focused molecules that sound “chemical”. Our preservatives are synthetic as I do not believe in natural preservatives at all. If an emulsifier is used (which in NIOD there usually isn’t any use for them), we do not use vegetable-derived waxes as they are terrible for the skin but none of our emulsifiers are in any way bad for the skin or the environment. I felt reassured by this, and as it’s been 20 years since I’ve used anything other than completely natural skin products, I was curious to see what a bit of advanced technology could do for my skin. So what exactly is it about NIOD? Apparently it’s the next generation of products using new technologies and this is the first time they’ve been put together in such formulations and strengths. Ok, so where to start? They actually have quite a few products in their range and I’ve been trying them all so will write about this over several articles. However, they have two core products. The two products that started it all and are a must even if you choose not to use anything else. NB All the products have technical names and are referred to in abbreviated form. NIOD itself stands for Non-Invasive Options in Dermal Science. As you can see from the photos, the packaging reflects this ethos and almost looks medicinal. Copper has become the latest byword in beauty. It’s actually not copper at all but a copper peptide. This watery blue liquid, which is the first thing you put on after cleansing, is actually designed to make your skin look younger. It puts your skin in a heightened state of repair, encourages skin health and works from the lowest depths of your skin to make it look and act younger. It basically tries to get your skin to behave like it did when it was younger. As your skin ages it loses collagen, gets pigmentation and can look sluggish due to sun damage and pollution. It’s aim is to prevent and even reverse visible skin ageing. They say that you will see a difference in 5 days!! Now, I address a lot of these issues through supplements and skin treatments but I do have quite a bit of pigmentation dotted all over my face. So what results, if any, did I see? The first thing was that the pigmentation, although still there, began to fade and even out. My skin seemed clearer and smoother too. It definitely helped with the texture of my skin. And yes, I did see results very quickly. Maybe a week or so? They also do a version of CAIS that is 5.00% and therefore much stronger. I tried this too but would recommend starting with the 1%. If you have lots of pigmentation (like me) then I think it’s good to have the 5% to use once a day or every other day. I was using it twice a day at one stage and my skin became quite dry. I feel sure that not many would be able to tolerate it so often so best to use occasionally. Very good for zapping that pigmentation though or really getting that skin back into youthful action. Designed to be used over CAIS. I think most of us have heard of hyaluronic acid which is used in lots of products to hydrate the skin and can also be taken as a supplement. It occurs naturally in the body but as with most things (so unfair), declines with age. It’s wonderful at hydrating and giving the skin a youthful cushioning except for the fact that it’s molecules are too big to penetrate the skin. Skin care companies have been furiously developing different types and sizes of HA to overcome this problem. MMHC takes this new generation of HA use to another level. It contains TWELVE forms of HA compounds in a peptide delivery system. The result is it encourages skin to produce more of it’s own HA for major anti-ageing effects and a little of that much desired “cushioning”. Skin becomes more hydrated and MMHC also acts as a barrier preventing any moisture loss. So how effective did I find it? My skin has in fact become very dehydrated and much drier with age. It’s taken a little getting used to because I had very oily skin in my youth. This means that I don’t always know how to handle my dehydrated skin and if I’m not careful I can start flaking quite badly. The great thing about MMHC is that it’s not at all greasy, is very light and absorbs instantly into the skin (well into my skin anyway). When I got a bit dry from over using the CAIS 5%, it literally took one application of MMHC on it’s own to get my skin back to normal. My skin now feels wonderfully hydrated and as I search for the cushioning effect in the mirror, I feel sure I can see a little. I could of course be kidding myself but the bottom line is that my skin feels good and feels hydrated. So how pricy is it? Personally I think the pricing is extremely reasonable considering the science, innovative technology and high quality ingredients. It’s not supermarket cheap but is much more reasonable than lots of the big brand skin care products that are literally awash with quite nasty chemicals. A couple more articles about the rest of their products will follow soon. To check out prices or buy NIOD at Victoria Health. If your skin is dehydrated go easy on the copper serum and perhaps only use every other day. The MMHC is a must and the next Ageless article is about some of their other products that are brilliant for hydrating the skin. They are used on top of MMHC. Would you like me to write an article about these products? Thanks for offer but as you can see I’m already writing about them myself. Really not sure about trying these as they are not organic.I have just stopped using ordinary products and find organic much nicer? I completely understand. I love organic products. These products would be good for someone really wanting cutting edge skin care to get visible results. 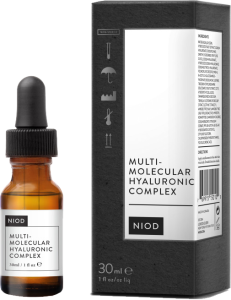 I wondered how you have found the NIOD FRACTIONATED EYE serum? I have been using it for about ten days and initially was bowled over. I now am beginning to think that the area under the eye is starting to look a little dehydrated and crepey. I have fine lines under the eye but overall good (slightly sensitive)skin. I had previously been using chantecaille for many years and more recently the organic pharmacy products as well. I didn’t have any issues at all with the product and found it very effective. However, we’re all different and sensitive to different things. Maybe take a break for awhile and then restart it in a couple weeks? See if it happens again? if it does, then I would lay off it as there might be someone in there that’s irritating your skin.